What do to with a lot of Avois and an Amex companion voucher…. two flights in First Class London to Rio sounded a good use! I flew out from Rio to London on Iberia in the new Business Plus (see review below for that), sitting in the two central seats. It was an ok flight, comfortable hard product, but the service was not quite as good as my previous flight with Iberia (mainly due to the one excellent member of the crew). But I was definitely looking forward to the flight back. I have flown BA First a number of times, but more often on the Rio to London route than the other way round. I much prefer London-Rio, as it is a day flight with no pressure to sleep, and I get to enjoy the Concorde Lounge beforehand. Some people might think I’m crazy, and like to sleep the flight away, but I find that a waste of some of the First Class experience (aka wine!). For this post, I’ll just talk about the ground side experience. 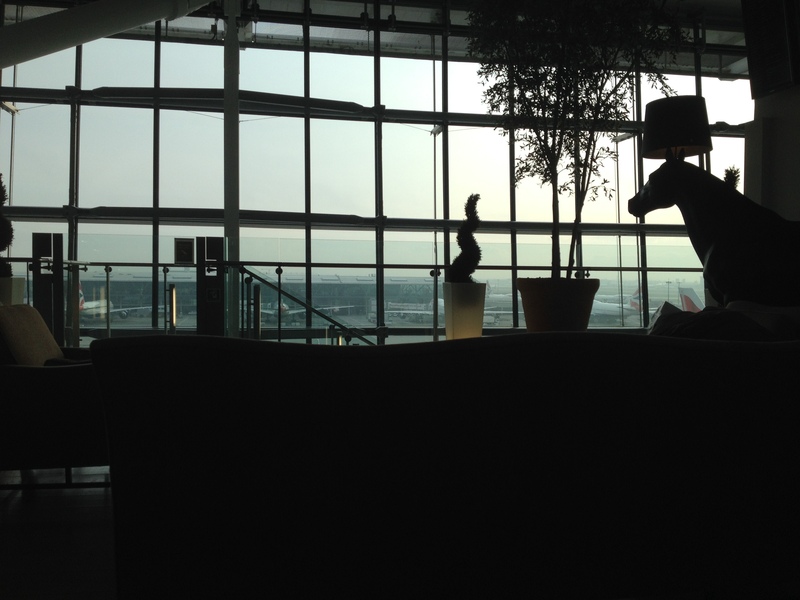 As always, I stayed in the Sofitel, and arrived at the airport around 9am for our 1pm flight, giving plenty of time to enjoy the lounge, do some shopping, and have the pre-booked massage at the Elemis Spa. The First Class checkin area in T5 is at the far side of the check in hall. The queue was short, and we quickly got the bags checked. The Check In area is nothing that special – they are standard check in desks, just in a closed off area with less queues. Fast Track security was quickly done away with, and through the door straight in to the Concorde Lounge. I know there are very mixed reviews out there, and I am sure there are better lounges in Asia and the Middle East that I haven’t been to, but I really like the Concorde Lounge. I’ve been there around 5 times now, and I haven’t seen it overly busy ever. I find the seating very comfortable, and plentiful every time I’ve been there. I’ve also never had a problem getting a table at the restaurant. The restaurant service can vary sometimes, and I have been left standing before being shown to a table, and not always had the most attentive service, which can be disappointing. 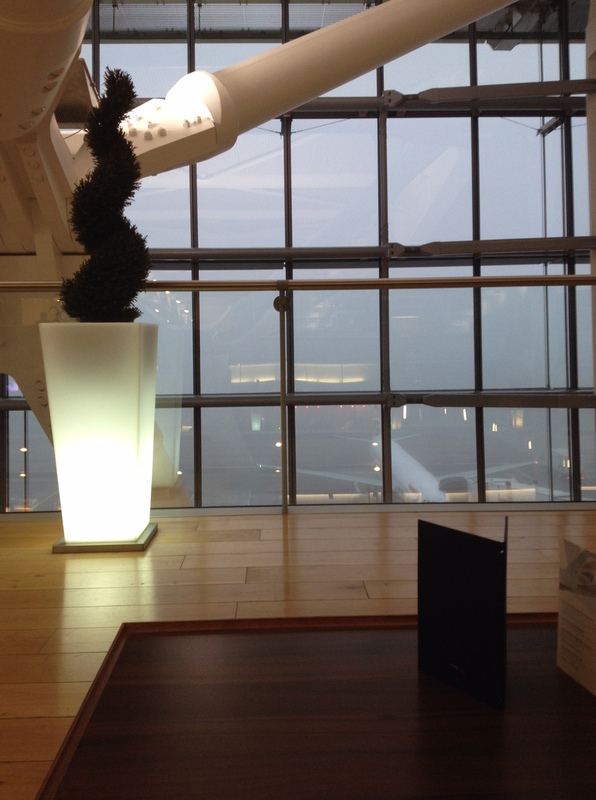 But in comparison to lounges such as the AA Flagship First in JFK there is simple no comparison. I really like having a table service restaurant, with a decent quality of food (at least every time I have dined). There are also the cabanas, I have never booked one, as I am normally only there for a couple of hours and it never seemed worth it. But if you are there for a while, especially on connections, you can book one of the cabanas which feature a bed, TV and shower – basically a mini private hotel room really. This trip the first port of call was the restaurant for breakfast, and a fairly decent full english with a class of champagne. 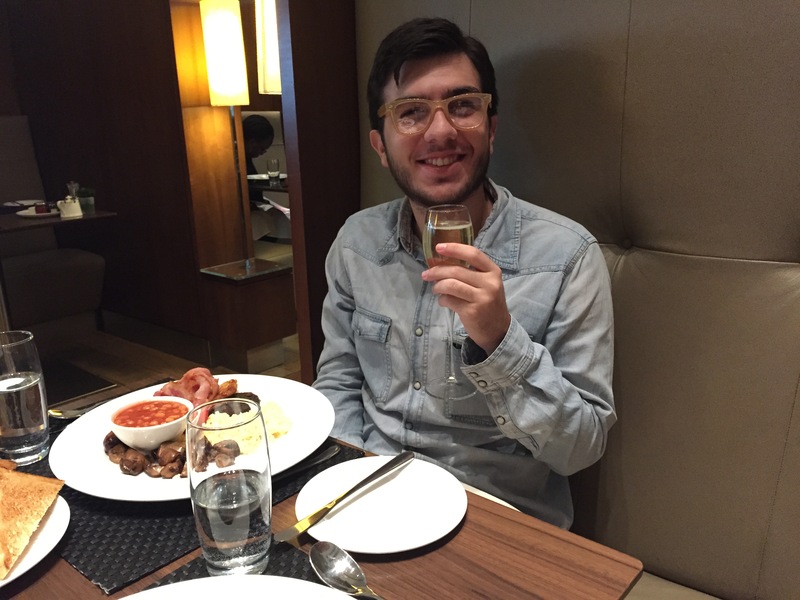 I really do like the fact you can drink Grand Siècle champagne in the lounge – it is a very nice champagne I hadn’t had before travelling First, and I would rate it very highly. After the meal we relaxed on the terrace with some more champagne for a bit, before it was time for the Elemis Spa. The weather does clear up sometimes to reveal a unicorn though…. I had booked, for the first time, the ‘Deep Clean Aviator Facial’. In the past I’ve only made use of the chair, and once the ‘Power Back Massage’. However this is a definite new favourite if I have the opportunity again. The issue is if you are not in First and able to pre-book, the chair is often the only thing available and even though it is far from guaranteed even with several hours in the lounge. Various different Elemis products and oils are used as a face massage, while at the same time having the chair massage on the whole body. After this there was just enough time for another champagne, a quick bit of duty free shopping, and off to C gates to board.